The API 512c is a mic / line / instrument preamp designed to provide a low noise, unusually good sounding front end for all types of audio systems. Sonically, it offers the distinct API sound at an extremely affordable price. 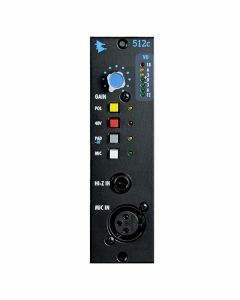 Offering low noise (-129 EIN) and 65 dB of gain, the 512c includes phantom power, and switchable polarity, -20 dB pad and Mic or Instrument/Line selector. Front panel XLR and 1/4 inch connectors combined with rear panel mic access allows for additional flexibility when installed into an API lunchbox®, API's 10 position 500V vertical rack, or an API console.